Thirty two times, the genealogical community has honored one of our best, one that we’ve lost. Thirty two times, the focus has been on someone who has made contributions to the field of genealogy that were of lasting significance in ways that were unique, pioneering, or exemplary. Thirty two times, individual genealogists and groups have nominated those persons whose achievements or contributions have made an impact on the field — and one has been selected: a genealogist whose unique, pioneering, or exemplary work lives on today. 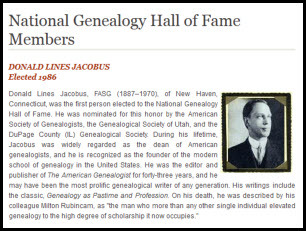 Starting in 1986 with Donald Lines Jacobus and continuing to 2017 with Peter Stebbins Craig, 24 men and eight women have been elected to the National Genealogy Hall of Fame. Peter Stebbins Craig was born in Brooklyn, New York, on 30 September 1928 and died in Washington, D.C., on 26 November 2009. A devoted historian and relentless genealogist, he specialized in publishing genealogies of the first European settlers of southeastern Pennsylvania, Delaware, and New Jersey. This settlement, better known as New Sweden, began in 1638 along both sides of the Delaware River. His pioneering research and significant publications on the early Swedish settlers in the Delaware Valley earned him fellowships from both the American Society of Genealogists and the Genealogical Society of Pennsylvania in 1991. In recognition of his contributions to Swedish history, King Carl XVI Gustaf of Sweden bestowed on him the title of Knight First Class of the Royal Order of the Polar Star in 2002. He was awarded a Lifetime Achievement Award in 2009 by the Swedish Colonial Society in Philadelphia. He was the founder of the journal Swedish Colonial News, published by the Swedish Colonial Society. There he published dozens of his articles on Swedish and Finnish in southeastern Pennsylvania and New Jersey. He served as both historian and genealogist for the Society. He also chaired the publication committee that initiated the Gloria Dei Church records series titled Colonial Records of the Swedish Churches in Pennsylvania. Now in six volumes, this indispensable reference work details the church records for the years 1646-1768. He left his extensive research collection including books and monographs to the Society. They are adding his research, “The Craig Collection,” to the Society’s website. As contributing editor for the Swedish American Genealogist, he published numerous articles. Especially notable are his “New Sweden Settlers,” an eight-part series that ran from 1996 to 1999, and “The 1693 Census of Swedes on the Delaware,” a series published 1989 to 1991. Thirty two of our best… And it’s up to us to help select the 33rd person. The National Genealogical Society and the National Genealogy Hall of Fame Committee are seeking nominations from the entire genealogical community for persons whose achievements or contributions have made an impact on the field. The next honoree and the society that honored the nominee will be announced at the NGS 2018 Family History Conference in Grand Rapids in May. Nominations for election to the National Genealogy Hall of Fame are made by genealogical societies and historical societies throughout the United States, and have to be submitted by 31 January 2018. My Peterson ancestor is one of those New Sweden settlers and I’ve relied almost entirely on Peter Stebbins Craig’s research. He was a remarkable man.